In the international payments world, the buzz is forever about Revolut and TransferWise, the one-time startups that have grown faster than anyone anticipated. But everybody has to start somewhere. This week we are taking a look at some of the most recently founded startups (who have raised less than $10m) and the problems they are trying to solve. Consumer facing products continue to be the most popular area to focus on. There remains little difference between many of the underlying products with everyone digital first. Each is focusing on solving for either a different set of currency corridors or with a small product twist. Due to the opening up of the regulatory environment in Singapore and Korea, Asia offers a different opportunity, since lower competition provides more of a green field (especially Korea). Offering hedging solutions has until recently been highly problematic due to the strict regulations around advising on risk and PSD2. To counter this, the UK’s FCA has taken a pragmatic sandbox approach which has enabled a number of companies such as Assure Hedge to get going. 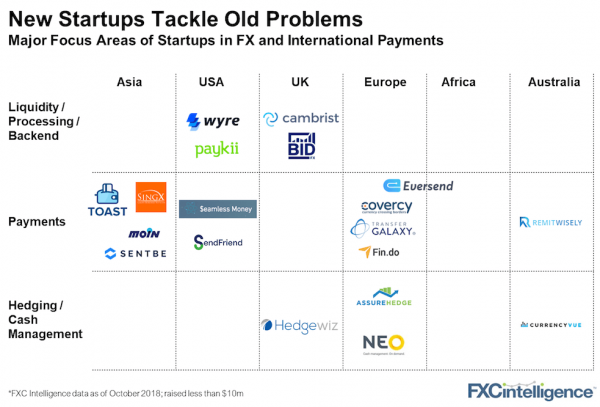 Whilst the US is often at the forefront of venture capital, when it comes to cross-border fintech, it remains well behind, as it’s state-by-state regulatory burden continues to create too high a barrier for most companies. Europe offers a much more welcoming startup environment. Even with the discussion around a federal fintech charter in the US, the opposition to it remains strong meaning don’t expect any change soon. Blockchain continues to be one of startup’s technologies of choice. Many of the companies above are powering their technology via blockchain, albeit to varying degrees. Wyre, SentBe, Eversend and Transfer Galaxy are all examples. Each company is taking a different approach, with Eversend powering a multicurrency wallet via blockchain and Wyre utilizing blockchain to support its liquidity offering. Just this week, a liquidity startup powered by blockchain, Adhara, raised $15 million in funding so support remains strong. We would expect to see a wide range of blockchain uses continuing. No company has won in the sector yet and no single use case stands out.